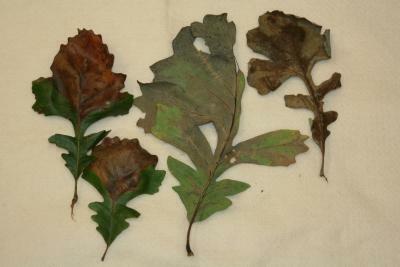 Bur Oak Blight is most commonly seen in Iowa and Minnesota, but has also been identified in western and southern Wisconsin, northern Kansas, eastern Nebraska, eastern South Dakota, and northern Illinois (1). The disease distribution aligns with the limited distribution of Q. macrocarpa var. oliviformis and has not been noted on the larger acorned, Q. macrocarpa var. macrocarpa (1). 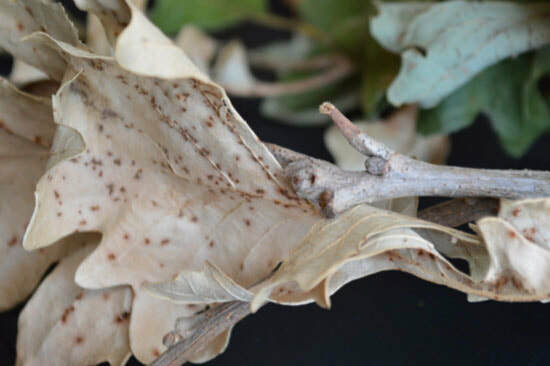 The disease lifecycle begins with black pustules (small raised spots) formed on the leaf stem, which provide the initial inoculum (figure 3) (1). The pustules then break open with wet spring conditions and conidia are dispersed by rain, which infects the shoots and leaves (1). Following a wet spring, susceptible trees are likely infected be remain asymptomatic for several months until petiole necrosissets in (1). Harrington, T. C., & McNew, D. L. (2016). Bur Oak Blight. In Diseases of Trees in the Great Plains. Rocky Mountain Research Station: USDA Forest Service. Pokorny, J. D., & Harrington, T. C. (2011). Bur oak blight. Newton Square, PA: USDA Forest Service, Northeastern Area, State and Private Forestry.